The delivery of data in real time to designated personnels' computers anywhere in the world. EDG has devoted many years to perfecting its unique approaches to liquid monitoring. EDG holds patents for the HydroSentinelTM systems along with patents for individual components within HydroSentinelTM that provides the necessary reliability and repeatability in performance. Where other companies have failed Envirodyne has excelled in online field monitoring. Our field monitoring units are specifically designed to insure our customers have 'instant' and 'reliable' data at their finger tips at all times. The use of EDG's HydroSentinelTM greatly reduces, or eliminates the demand on organisations to resort to 'manual sampling' and 'laboratory analysis' to provide good historical data. To our customers this means a cost effective alternative to traditional and laborious tasks. Schematic layout of HydroSentinelTMdeployed in monitoring a sewerage tunnel. Note: EDG proprietary features incorporated in the Auto Sampler and Sample Preparation Unit (patented) provides for the reliable sampling and sample preparation to prevent blockages and malfunction of the analytical systems. 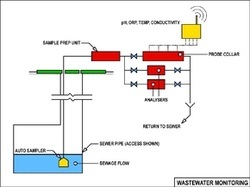 In the data displayed here, the HydroSentinelTM monitoring unit has been monitoring a wastewater discharge every 15 minutes, and has been configured to alert operators and regulators when an analysed sample shows results outside a predetermined range. The unit also captures a sample and retains in a refrigerated section of the unit for retrieval and detailed analysis later at a lab. A SMS message is sent to a designated person and informs him/her that a sample has been collected that may indicate (say) a breach. HydroSentinelTM via its duplex capability, can also automatically open/close discharge valves, stop/start pumps, etc., to prevent an environmental mishap. Wastewater Chemical Dosing Systems - chlorine, iron salts, biological, oxygen, etc..
EDG continues to develop additional capability for HydroSentinelTM systems. We have developed the Mk 2 version of HydroSentinelTM, and will soon be able to analyse for a range of heavy metals, sulphides, nutrients all online and with typical system reliability. Contact us for further information on HydroSentinelTM Mk 2 capabilities. "If you can't monitor it, you can't manage it!" A HydroSentinelTM installation on a Sewage Pump Station site, monitoring at 15 minute intervals for pH, Redox Potential, Conductivity, Sewage and Ambient Temperature and Hydrogen Sulphide gas. Analytical data is uplifted to a host website for the client. 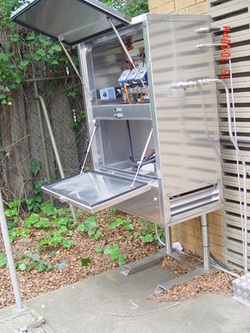 Condition monitoring is carried out on the auto sampler, cabinet temperature and the temperature of the refrigerated lower section used for the collection of samples when a parameter breach is detected. 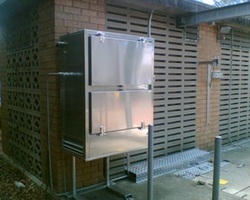 HydroSentinelTM unit with access doors open to the analytical section and the refrigerated compartment.